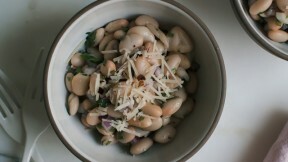 To a large bowl, add the beans, Italian parsley and red onion. To a small bowl or to a mortar and pestle, add the anchovy paste or anchovy filet, garlic clove, juice from 1 lemon, olive oil and crushed red pepper. Stir vigorously until combined. Pour over the beans and toss gently until combined. Give it a taste and adjust the salt according to taste.